With the 2019 WHL Playoffs underway, WHL.ca provides a look in at each of the four head-to-head second round matchups across the league. With a general introduction, vital statistics and keys to the series, we’ve got everything you need to know heading into the second round of the 2019 WHL Playoffs. Plus, we will kick it up a notch with a highlight reel featuring key moments from the head-to-head season series. While the usual suspects are well known, our ‘Players to Watch’ section will take a deeper dive into some of the supporting characters set to take on a big role in the post-season. We close each of our series previews with a quick look to the past for a brief historical take on the rivalry that exists – or stands to ignite. 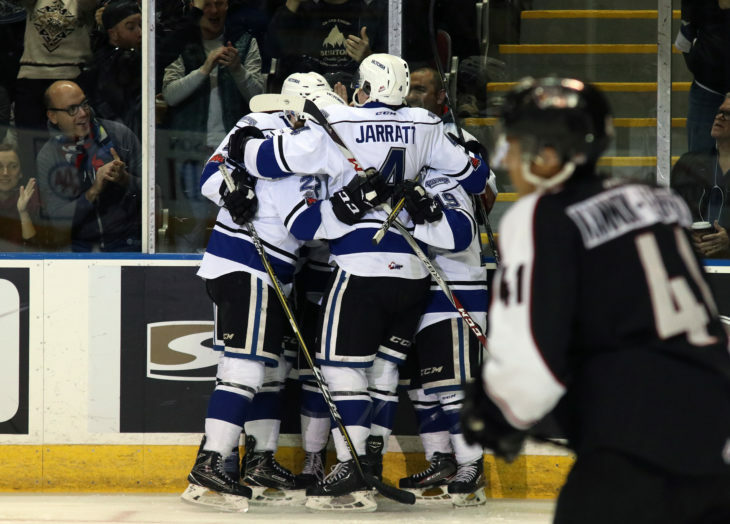 In our third of four 2019 WHL Playoffs second round previews, we examine the Vancouver Giants and Victoria Royals. 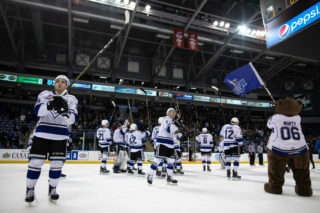 The coastal clash, the Georgia Strait rivalry, or whatever you want to call it just know the Vancouver Giants and Victoria Royals will providing an entertaining addition to their geographical rivalry in the second round of the 2019 WHL Playoffs. 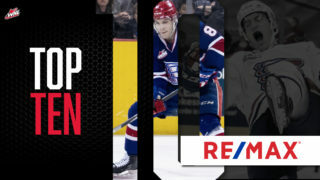 In their first-round meeting last year, the likes of Tyler Benson, Ty Ronning, Matthew Phillips, and Tyler Soy went head-to-head in an entertaining seven-game series before continuing their hockey careers in the professional and post-secondary ranks. This year’s edition of the rivalry may not feature any of those four names, but there’s no shortage of talent on either side this time around either as last names like Koch, Byram, Outhouse, and Walford take over the spotlight this time around. This year, the Giants rose from third in their division to first in the Western Conference, earning home-ice advantage. In the absence of two of the team’s all-time leading scorers, the Royals did well to rebound, finishing second in the B.C. Division with another 30-plus win season. The Giants owned the better record in the 10-game season series with a 6-2-1-1 mark, but only outscored the Royals by six goals, not including shootout goals. While many will happily give the advantage to the Giants based upon the talent they have available at all three positions, that should provide hope and confidence to Victoria that they’re well within striking distance of the Giants and could be one or two bounces away from a series win. Leading the way for the Giants up front is top-scoring forward Davis Koch. The WHL McSweeney’s Player of the Month for March led the Giants with 10 points (1G-9A) and finished tied for first in scoring through the first round. On defence, Bowen Byram continued to elevate his play with eight points (3G-5A) to stand second among the Giants’ offensive contributors. Jadon Joseph led the Giants with six goals. 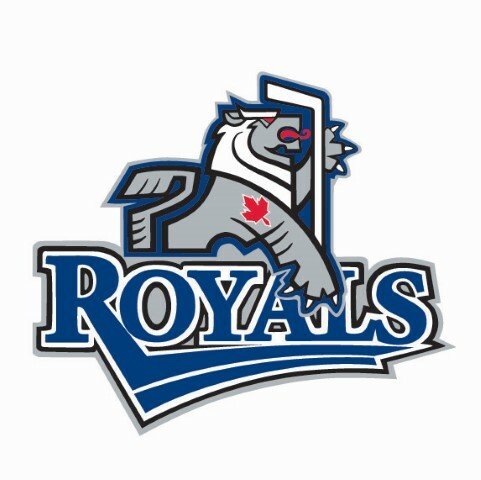 The Royals turned to import forward Phillip Schultz to lead them in the first round. The Denmark product responded with nine points (2G-7A) in a six-game series win over the Blazers, earning second star honours for the first round of the 2019 WHL Playoffs. On the blue line, Montreal Canadiens prospect Scott Walford tallied five assists in six games and was a reliable member of the Royals’ defence. If the Royals want to slow down the Giants’ offence, they’ll need Walford at his best throughout the series. Dino Kambeitz led the Royals with five goals in six games. Despite the wealth of talent at forward and defence, the best battle of the series will most certainly come between the pipes. The Giants rolled with David Tendeck and Trent Miner in the first round with each claiming a 2-1 record. Both had success against the Royals in the regular season, posting sub-2.00 goals-against-averages, and save percentages a shade above and a shade below .920. At the other end of the ice, Griffen Outhouse played every single minute of team’s series win against the Blazers. The stalwart in the blue paint has 126 WHL victories, combining regular season and playoffs, to his credit and there’s no doubt he’s one of the team’s top performers. Now in the final run of his major junior hockey career, Outhouse has his sights set on another series victory against the Giants and getting the Royals past the second round of the WHL Playoffs for the first time in team history. Game 1 of the series will take place Friday, April 5 (7:30 p.m. PT) at the Langley Events Centre before shifting to the Save-On-Foods Memorial Arena for Game 3 on Tuesday, April 9 (7:05 p.m. PT). First Place – B.C. Division Standing Second Place – B.C. Just win, baby: Al Davis of the Oakland Raiders coined the famous sports phrase well before the Giants came into existence, but the statement holds true for them entering the second round. In their 2018 first-round matchup, the Giants earned two of their wins on the road and did the same in the 2019 as well. Maybe the Giants embrace the challenge of shutting down an opponent on home ice and robbing their fans of in-person celebrations, but as long as it keeps working and they keep advancing, it doesn’t require any huge changes. Even looking at the regular season series against the Royals, the G-Men collected a 2-1-1-1 record in the provincial capital, showing their penchant for playing on the road. If they can combine that with stronger home play, it would obviously make for a short series and a quick continuation of their season. Too close, a little too close: We can debate the merits of ‘puck luck’ until we’re blue in the face, but at the end of the regular season series six goals made the difference between the offence produced by the Royals and Giants. That includes 4-0 and 4-1 losses where the Giants were just too much for the Royals while also factoring in six one-goal games. When you breakdown the goals scored by period in home and away, both clubs can share some similarities. Each team has allowed just a single goal in the second period to their opponent when on home ice. The Royals outscored the Giants 4-1 in the middle period at the Save-On-Foods Memorial Centre while the Giants owned the second period at the Langley Events Centre by a 5-1 margin. Both teams outscored each other 5-4 in the third period of their own home rink while the Giants controlled the first period scoring in both arenas. In Vancouver, the difference is just a goal while that gap grows to three in the provincial capital. While the Giants may have intimidated some with their deep roster, the Royals were one team that was able to stay focused in the present and make the season series interesting. Better yet, if Victoria can hang with the Giants through regulation, they have an even record against the Western Conference leaders in extra time, winning an overtime matchup and shootout contest in the regular season. RW Davis Koch (28-50–78): With the amount of assists he records on the ice, Davis Koch has provided another assist to writers looking for an easy choice among Giants forwards to focus on heading into the second round. The WHL McSweeney’s Player of the Month for March impressed against the Seattle Thunderbirds with 10 points (1G-9A) in the six-game series and led all WHL players in the month of March with 24 points (5G-19A) in 14 regular season and playoff games. The 20-year-old White Rock, B.C. product began his WHL career in 2013 with a pair of games for the Edmonton Oil Kings. Some five years and 344 WHL regular season and playoff games later, Koch has always been a steady offensive producer. Now, he’s appeared to find another level with his game and it’s boosting the Giants’ hopes for a long playoff run at the right time. LW Phillip Schultz (19-17–36): Picking a player in the first round of the CHL Import Draft doesn’t always ensure a player will have offensive success at the WHL, but Phillip Schultz has done that and more for a Royals team with a hole in their offence after the off-season departures of Tyler Soy and Matthew Phillips. The Rodovre, Denmark ranked third in terms of goals scored for the Royals in his rookie season and was third in scoring among rookies in the B.C. Division, behind only Justin Sourdif of the Giants and Lassi Thomson of the Kelowna Rockets. In the first round against the Blazers, he led the Royals with nine points (2G-7A) and was named the WHL’s Second Star of the first round. In the regular season, he had four points (1G-3A) against the Giants. As a driving force in the first round, the Royals will no doubt lean on him again while the Giants will look to contain the rookie. Dylan Plouffe (8-27–35): So there’s no denying Bowen Byram is one of the players to watch in the series, but the 19-year-old Dylan Plouffe is also worthy of equal attention in this series. As the Royals will most likely be stuck on Byram like glue, that could very well open the door for Plouffe to have a series like he did against the Thunderbirds. In the six-game series, the Sherwood, Park, Alta. product posted seven points (4G-3A), including a pair of goals and three points in the Game 1 win. The Giants’ second-round selection from the 2014 WHL Bantam Draft has been with the team for more than 250 WHL games counting the regular season and playoffs together and is contributing at the right time. How he continues that against the Royals will be of importance to the Giants. Also, Plouffe officially turns 20 on April 27 and what better birthday gift to give yourself than to still have your team in the hunt for the Ed Chynoweth Cup? "Pucks on net." – @Dplouffe_61 probably. 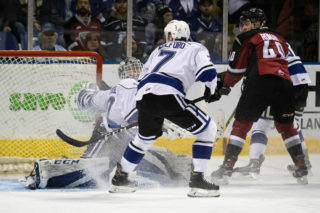 Scott Walford (9-38–47): Home-ice advantage may officially belong to the Vancouver Giants in the series, but the real winner here is Royals defenceman Scott Walford. He’ll get to start the series at the Langley Events Centre, just a short 26-minute drive away from his hometown of Coquitlam, B.C. The series will then shift to his second home of the Save-On-Foods Memorial Centre where he’s played the majority of his junior hockey career. As the Royals’ leading defenceman, the 6-foot-2, 198-pound rear guard was one of the holdovers from the exodus of talent, keeping Victoria strong on the blue line. The Montreal Canadiens prospect tallied five assists in the first round and will be posed with the challenge of limiting Vancouver’s offence over the next four to seven games. Trent Miner (32 GP, 24-5-1-1, 1.98 GAA, .924 SV%, 3 SO): Of the eight teams left in the 2019 WHL Playoffs, seven of them have clearly established their leading goaltenders that will go between the pipes night-in and night-out. 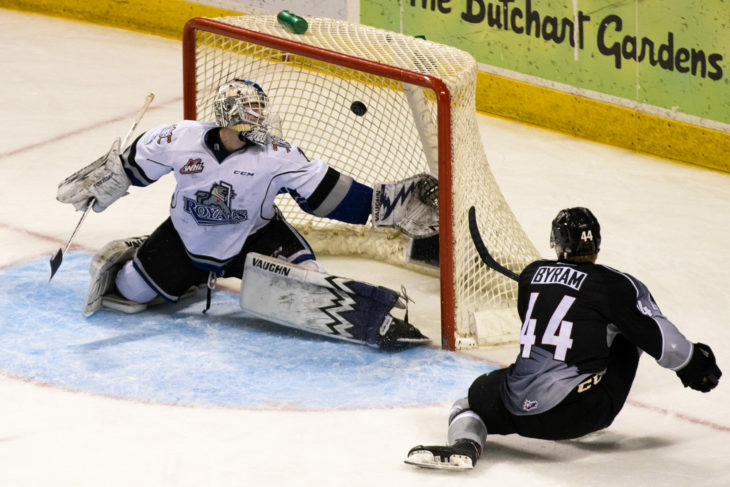 For the Vancouver Giants though, their advantage on the competition lies within having two top-tier goaltenders when Miner is paired with Arizona Coyotes prospect David Tendeck. Trent Miner is ranked sixth among North American goaltenders ahead of the 2019 NHL Draft by NHL Central Scouting and he’s earned every bit of that high praise. The two time WHL Eli Wilson Goaltending Goaltender of the Week answered the call in Games 1, 2, and 5, allowing six goals in 179 minutes of action. Ultimately each goaltender took a pair of wins and a single loss from their six-game series victory so it’s hard to say who’ll get the start in Game 1. Miner did his part in the regular season matchup against the Royals with a 2-1-0-1 record, 1.97 goals-against-average, and a .919 save percentage. There’s no doubt Miner will play a key role going forward, but it’s just a question of whether it’s as the backup or the starter. Either way, the recently-turned 18-year-old from Brandon, Man. has a bright future ahead of him in the short and long term. 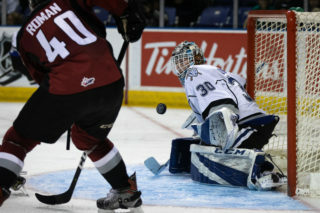 Goaltender Trent Miner of the @WHLGiants has been named the WHL @EliWilsonG Goaltender of the Week! Griffen Outhouse (46 GP, 27-16-1-1, 2.81 GAA, .913 SV%): There no questioning that the makeup of the Victoria Royals at forward and on the blue is different today than it was in the 2015-16 WHL Regular Season. However, the one constant for them over the years has been in the blue paint as Griffen Outhouse has appeared in 196 of the team’s last 284 WHL regular season games. 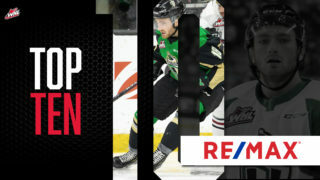 His 114 regular season victories rank among the WHL’s best in terms of longevity and he has claimed several franchise records this year that could stand the test of time. Outhouse turned 21-years-old on March 13 and guided his team through a tough first-round matchup against the Kamloops Blazers. Allowing 16 goals over the six games, Outhouse wasn’t perfect, but he gave his team a chance to be in every game as they never trailed heading into the third period of each contest. For his 6,000-plus saves in the regular season and playoffs combined, the Royals will lean on Outhouse to be at his best over the next four to seven games if they’re to have a good chance of advancing. 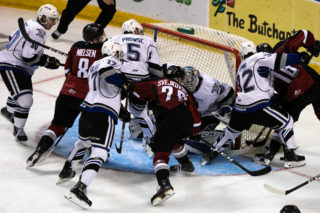 In the third year of their existence, the Vancouver Giants advanced to the second round of the WHL Playoffs for the first time. Earning a 4-1 series win against the Kamloops Blazers, Ty Morris became the first Giant to score a series-clinching goal when he scored on Devan Dubnyk 6:43 into overtime of Game 5 on Saturday, March 27 at the Pacific Coliseum. That playoff run ultimately ended in six games against the Everett Silvertips, but the team had its first taste of WHL Playoffs success and was hungry for more. The history books tells us they’d fulfill their appetite in the next few years with the legendary Don Hay guiding them to a WHL Championship and Memorial Cup. This year’s team has that same hunger for success. Will the Giants meet up with the Silvertips for a rematch of that series, earning a chance at some revenge? After their first series win since 2010, how far will they be able to build upon their success going forward? Life can just be a kick in the pants sometimes. 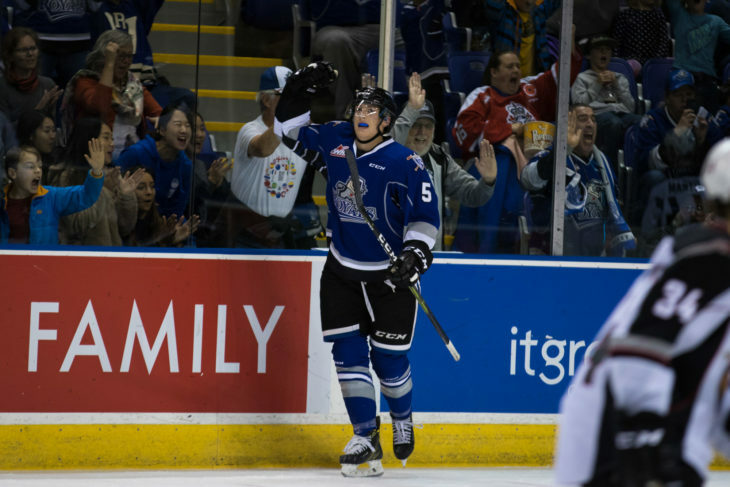 The Victoria Royals have consistently been one of the B.C. Division’s best teams, sliding below the 30-win mark just once since 2010. That’s resulted in 10 consecutive trips to the WHL Playoffs and four series victories, but the second round has historically been tough to endure on Vancouver Island. In their four trips to the second round, the Royals have a combined five wins. They came close in 2016 with a seven-game series loss to the Kelowna Rockets. Each of those losses no doubt weighs on the mind of the team, but there is renewed hope as the years change. Will this year prove different for the Royals? Can they overcome the demons of playoff years past and rise beyond? The Victoria Royals celebrate a goal in Game Seven of the first round in the 2018 WHL Playoffs. Photo: Jonathon Howe.